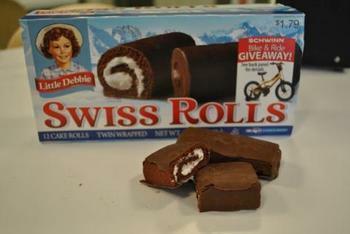 Little Debbie isn't what she seems. That's the message from the nonprofit Center for Science in the Public Interest, which says Little Debbie Swiss Rolls are short on chocolate but long on food coloring. CSPI says the popular treats have a combined 32 milligrams of Yellow 5, Red 40, and Blue 1 per serving. That level of artificial food dye is troubling, according to the group, since clinical trials have shown that modest percentages of children experience adverse behavioral reactions after consuming about that much. All that dye makes up for the absence of cocoa, according to CSPI. It says the primary ingredients in Little Debbie Swiss Rolls, manufactured by McKee Foods, are sugar, water, flour, and oil. Less than two percent of the product is cocoa, which means that much of the dark, chocolatey brown color of the product comes from yellow, red, and blue dye. Little Debbie isn't alone, and, in fact, some foods have even more dye per serving. Betty Crocker’s Black Decorating Cake Icing has 80 mg of dyes per serving, Pillsbury Supreme Collection Red Velvet Mix has 66 mg, and Blue Bunny Red Carpet Red Velvet Premium Ice Cream has 49 mg of dye per serving, CSPI said. In a letter to McKee Foods president and CEO Mike McKee, CSPI urged the company to make a public commitment to eliminate the use of dyes by the end of 2017. CSPI also pointed out that at least one of Little Debbie’s competitors, Hostess, is making a chocolate snack cake that doesn’t contain synthetic dyes. “As many parents have told us, behaviors triggered by the dyes in foods impair the health and wellbeing of the child and the entire family,” CSPI wrote.